Few bands have been forced to take as much crap as Swedish metal heads Hammerfall. I might not be their biggest fan ever, but the criticism towards the band is sometimes so harsh and mean that you feel sorry for the guys. Because love them or hate them, you have to give them tribute for never backing down, no matter what any mob might have to say about them. Make no mistake, these guys released their debut album Glory To The Brave in 1997, when grunge was fading out and nu-metal started to rear its ugly head and the title of that album was very suitable as coming out as a heavy metal band in 1997 was a very brave and bold move. And the glory? Well, let’s say that Hammerfall created a huge fan base with that album – and its follow-ups Legacy Of Kings (1998), Renegade (2000) and Crimson Thunder (2002). But, I can might as well admit that I was never that impressed with the band. Quite the contrary, I though that Hammerfall was nothing but an ordinary metal band in the second division, but their big fan-base said otherwise. No matter what, Hammerfall will always have my respect, see, this band brought metal back, more or less all by themselves – at least in Sweden and Scandinavia. They kept their long hair, leather pants and devil horns in a time when you either wore flannel and a goatee and looked like you had been living on a diet of heroin your whole adult life and played the music that was the soundtrack to that – depressing stuff – or turned your hat backwards, sampled music and talked to a drum machine while you acted really angry. For shitloads of young people, metal was introduced by Hammerfall – they were to teenagers in the mid 90’s what Iron Maiden and Judas Priest was for me and my friends in the early 80’s. I remember the older rockers hating Iron Maiden’s guts in 1983. Why on earth would you wanna listen to Iron Maiden when you could listen to Deep Purple, they spoke condescending to me and my friends. When I think back to when I first heard Hammerfall, I was one of those older metal-fans that spoke condescending to the kids about their favourite metal band – I thought Hammerfall was a joke – what a hypocrite I was. But as I wrote earlier in this review, they have my respect and they have had that for quite a while now. The first Hammerfall album that I liked was 2005’s Chapter V: Unbent, Unbowed, Unbroken, ironically an album that divided many fans, but to me it was with that album that Hammerfall fattened their sound and brought out an album that didn’t sound like a demo tape. But it was when the band recruited former The Poodles / Zan Clan guitarist Pontus Norgren for their 2009 album No Sacrifice, No Victory that things started to happen for real, especially when it came to the sound and production. In my book, that album was Hammerfall’s best to date and for the first time, the production really clicked. But if there was one album that divided Hammerfall’s audience into two camps, then it was their last album Infected (2011). For the album they boys had hired James Michael (Sixx A.M.) for production duties which he handled with singer Joacim Cans and guitarist Oscar Dronjak. The album was a more hard rock kind of record and with more nuances and some of the heavy / power metal influences had gone. Let’s say that the album was a bit more out of the box and didn’t sound the way people were used to. Me, I thought (and still think) it was their best album and had hoped for a continuation on that sound. After a short time-out, the band, however, decided on getting back to their roots and I guess many a Hammerfall-fan was happy for that decision. Back in the control room was James Michael who produced this together with Joacim, Oscar and Pontus. James Michael is, to an outsider, a pretty strange choice. Everyone who has heard his solo stuff or Sixx A.M. knows that he don’t even exist in the same universe as Hammerfall, musically. I could understand them chosing him when they wanted to go outside their metal-box for the last album, but this album was supposed to be a “back-to-the-roots” kind of album so in my book, using James seemed like a bit of an overkill. 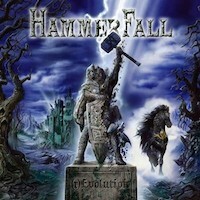 With the opening track “Hector’s Hymn”, Hammerfall show that they are back in business for real. A nod to back when it sure is – Hector being Hammerfall’s old mascot – so it wasn’t only in the music that they went back for inspiration. Musically, the song sounds like a classic Hammerfall song and I am also getting a big Manowar vibe with it. The title track is a melodic hard rock / metal track with a catchy melody and the same can be said of “Bushido” – great stuff. “Ex- Inferis” is probably the best track on this album with its big chorus and a heavy metal choir making the song more bombastic than bombastic. On “Evil Incarnate” they almost take their love for Manowar a bit too far and “Tainted Metal” has a really dull and cliché chorus which is sad as the song starts out with a great verse. “Wildfire” is a fast track that closes the album in a great way with some really huge backing vocals and they go out with a bang. (r) Evolution turns out to be a pretty good album when all is said and done. So, there are a few fillers too many and sometimes they are a bit too cliché for comfort, both musically and lyrically. James Michael turned out to be a really good choice for the production this time as well, which makes for a really good sound – important when a band goes back to basics and moves backwards instead of forward. That is understandable, though. They went for a little walk in Experement-ville, did their thing and then headed back to who they are musically and I guess that’s where their fans wants them to be, so no shadow over the band for doing so. For someone like me, who has never been a fan of the band and who thinks that Infected was their best release, I still must say that this album really beats the hell out of their early releases and I would be surprised if their fans will be disappointed by this. This is as much metal as it gets.